Brenda Laurel, designer, researcher, teacher & writer. Since 1976, she has been a pioneer & entrepreneur in interactive media, human computer interaction & human-centered design research. Moderated by Kate O'Riordan, UCSC Associate Professor in Art, research areas include digital cultures, biotechnology, science media, artscience, & bioart. Heather Logas, UCSC Computer Science lecturer and DANM alum with Noah Wardrip-Fruin, UCSC Associate Professor of Computer Science, DANM Program Chair, co-Director UCSC Expressive Intelligence Studio, and Jennifer Parker, Associate Professor and Chair of the Art Department, Executive Director of UCSC OpenLab, and DANM Mechatronics Research Group. 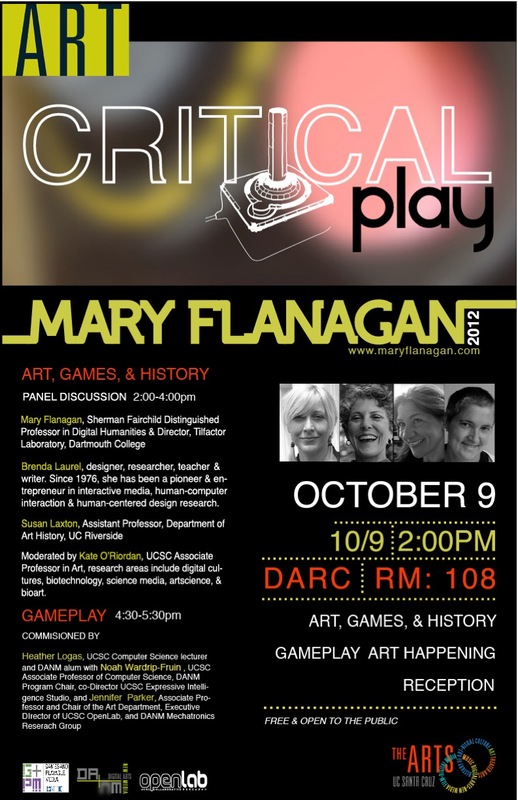 Co-sponsored by the Art Department, The Center for Games+Playable Media, DANM and OpenLab.